Can you feel it? It’s Love, love is in the air and Valentine’s Day is just around the corner! A day full of love, giving out positive vibes all around, indeed a special day of the year. How about making this occasion even more special? This Valentine’s week, VuLiv Media Player brings you a chance to grab awesome prizes and make your Valentine’s a lucky one. 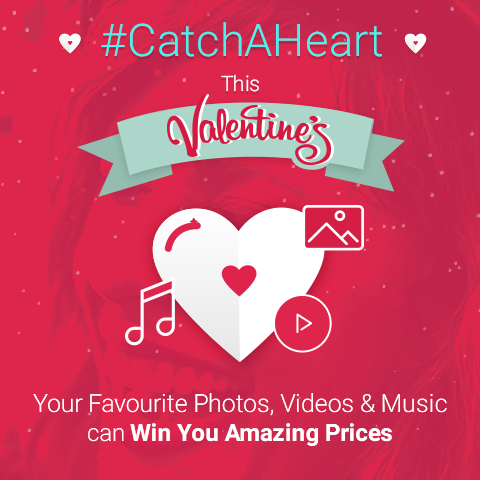 Just favourite your Photos, Videos and Music in VuLiv Media Player app and stand a chance to win amazing prizes. What you need to do is find and tap on the heart button to favourite the pictures you’d like to see most often or the songs that you love listening to. Yes, you can even favourite your videos! All that is required is a long press on the video you like most by entering the folder. iOS users, don’t loose heart just listen to your music. Favourite your songs to create a playlist and keep listening because the more you listen the luckier you get! So what are you waiting for just love what you like and get lucky! Click Here to get started! 1. #CatchAHeart contest is open to the registered users of VuLiv Media Player on Android and iOS. Android Users : Favourite as many Photos, Songs or Videos as you can during the contest period (7th-12th February 2017). Contest closes on midnight 12th February 2017.
iOS Users: Favourite your songs to create a playlist and keep adding more! REMEMBER the mantra, the more you listen the luckier you get. 4. The winners will be announced on 14th February, 2017 on VuLiv Facebook page.